I heard this one for the first time yesterday at a talk I gave at the Alameda Tuesday Club, a local Portland philanthropic and social group with a fascinating 100-year history. Judy, the woman who shared this said that it is an Amish saying and I knew I’d find use for it right away. And I hope there’s some truth to it because I think I’m on the verge of wearing you all out with root veggies. Next week you’re going to get a break from them for sure but this week I am eager to answer some of the questions that surfaced from last week’s post. I received inquiries about what to do with parsnips and cabbage so here we go. On the cabbage front this gratin and this soup should serve you well. I was also asked about how to make cabbage a little more kid-friendly and in my experience the below recipe for Japanese Cabbage Pancakes (Okonomiyaki) is a great way. Please report on how they go over. Sliced parsnips, celery root and rutabaga. Now to Parsnips, which are inherently very sweet and if fresh, very tender. Their core can get a bit woody and fibrous if they have been in storage for a long time but before you cut out the core (which is kind of a pain to do), taste a thin slice raw and you’ll be able to gauge whether or not you can keep it. Chances are you can especially if you’ve gotten them from a farmers market or CSA box. Parsnips are wonderful additions to this veggie hash or these latkes. However, for a dish where they truly shine, try this light “cake” in which they are paired with celery root. Often gratins are heavy on the cheese and/or milk. However, in this version, some simple broth or stock (or veggie bouillon) provides the moisture and thyme, salt and pepper are the only seasonings and the result is light yet sweet and rich from the veggies themselves. It would be awfully hard to wear me out on root veggies and winter produce in general so I definitely stand by the Amish saying (at least the latter half!). Lastly, I have a couple more spots in this Saturday’s Greens Class (a short and inexpensive class) and have posted a handful of new ones! You can make this as written with parsnips and celery root or substitute rutabagas or turnips for the celery root. I’m sure potatoes and sweet potatoes would be comfortable in the mix too so feel free to use it as your use-up-random-veggies dish if you need to. 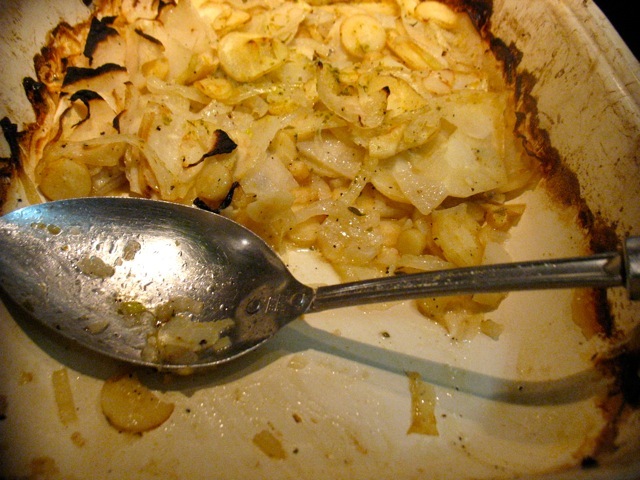 I made the dish pictured above with parsnips, celery root and rutabaga and it was delightful. As I note above, parsnips can have woody and fibrous cores but if they are quite fresh they probably don’t and you don’t need to cut out the core. Taste a thin slice raw and see how it seems. I’ve found that parsnips I buy at the farmers’ market are quite tender all the way through, even the really big ones. You want to slice your veggies very thin. A sharp knife works great if you’re comfortable and a bit practiced and the food processor is a good alternative too. 1 large or 3 small (or 2 medium! 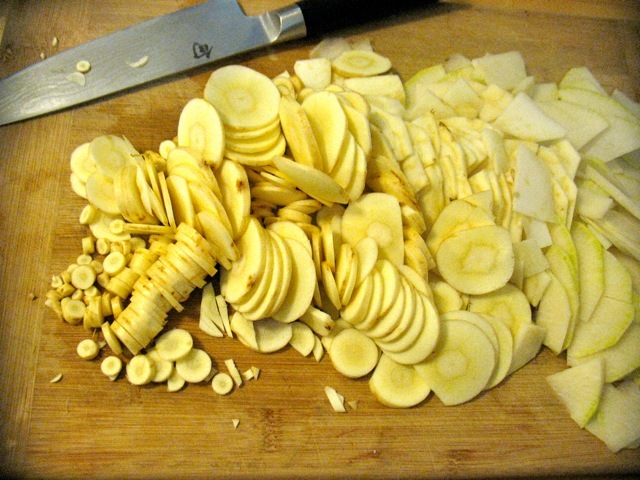 :) parsnips, scrubbed and thinly sliced. Toss the sliced onion and veggies in a large bowl with they thyme, at least a teaspoon of sea or kosher salt and plenty of pepper. You need to be generous with the salt. Put the butter in a baking dish and place it in the oven while it’s preheating. When the butter is melted add the veggie mixture and combine well and pack the veggies down as evenly as possible. Pour the stock or bouillon over the mixture. Place a piece of wax paper or aluminum foil over the veggies and press down firmly. Bake for an hour and then remove the foil and turn your oven up to 425 (or to broil if you’re in a hurry) and cook for another five minutes or so until the top is nicely browned and the veggies are very tender. These pancakes are fantastic. They make a light supper with a salad on the side. Don’t be put off even if you don’t love cabbage. They are quick, cheap, and I have yet to encounter any resistance to these, adults and kids alike. Traditionally they include shrimp though I always make them without and love them that way but by all means add 1/2 cup of chopped shrimp if you like. Makes about 12-18 pancakes (depending on how big you make them). In a large mixing bowl, whisk eggs with the soy sauce, sesame oil, and salt. Gradually add the flour until incorporated. Fold in cabbage, scallions, and shrimp. Warm a tablespoon or so of oil in a skillet over medium-high heat until glistening. Spoon the batter into the skillet in whatever size you like. I make them about 4-5 inches in diameter. Cook on each side for about 3 minutes or until golden brown. Keep pancakes covered in a warm oven as you make the rest. Scatter sesame seeds on top of pancakes and serve with dipping sauce.